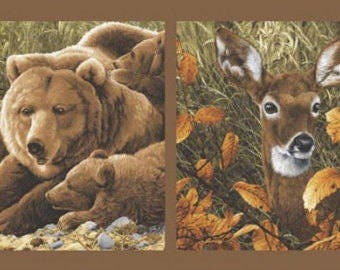 Andover Fabrics Brown Bear Deer Fabric Panel Wildlife Outdoors 24"
Create a Pillow or Wall Hanging with this lovely Brown Bear and Deer Fabric Panel. 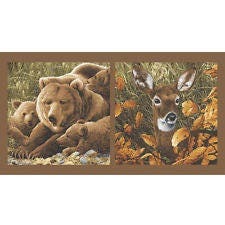 The Bear and Deer Print are each approximately 22 x 22. Made by Andover Fabrics. For Andover Fabrics this cotton print fabric is perfect for quilting apparel and home decor accents. Colors include brown tan black and green.